An unusual sound penetrated my train of thought as I sat studying at my desk. I looked up pensively from my book and a few moments passed before I realised that what I was hearing was the sound of pouring rain. A sound so common back in my hometown,Cape Town, was now so foreign to me in the desert city of Madinah. I rushed out onto the balcony to admire the rainfall. As I stood, witnessing Allah’s answer to the prayers of the community, a strange sight caught my eye down below. A man, instead of running for cover, walked calmly to and into his building. He reappeared shortly carrying a chair. Still in a state of composure, he placed thechair out in the pouring rain and just sat down! He appeared to be enjoying the sensation of the raindrops falling on his skin. I was intrigued. It is Sunnah (A practice of the Prophet (pbuh)) to stand in the rain and to expose a portion of your body to it. Its narrated by Imaam Muslim in his authentic compilation from the hadith of Anas, He said: It rained upon us as we were with the Messenger of Allah (may peace be upon him). The Messenger of Allah (may peace be upon him) unveiled his garment (from a part of his body) until the rain fell on him. We said: Messenger of Allah, why did you do this? He said: Because it (the rainfall) has just come from the Exalted Lord. The scholars have taken proof from this hadith that it is Sunnah (recommended) to expose your body and clothing to the falling rain. Out of happiness that Allah is sending down his blessing and moreover rejoicing that its falling down on us. And the meaning of the phrase: “Because it (the rainfall) has just come from the Exalted Lord.” is mentioned in the explanation of Sahih Muslim of Imaam Nawawiy by saying: That the rainfall is a mercy which Allah has just created, therefore use it as a blessing. Imaam Ashafi’ee mentions in his book Al-Umm: It is narrated by Ibn Abbaas (RA): That the rain fell from the heavens so he told his servant to bring out his mattress and saddle so that the rain may fall on it. Abu Jawzaa’ then asked Ibn Abbas: Why are you doing that, may Allah have mercy on you? He (Ibn Abbas) then said: Do you not read the book of Allah: “And we have sent down from the heavens water that is blessed” [Surah 50, Verse 9], Therefore I would like the blessing to fall (incur) on it. 1. The Sunnah of exposing oneself to the rain can be obtained by unveiling any portion of one’s body no matter how small the portion may be like one’s head or arms. 2. One should not expose one’s Awrah. 3. Avoid standing in the rain if it may cause harm or sickness to oneself. Imaam Albayhaqee states that this is a narration from Umar (may Allah honour him) and not from the Prophet (may peace be upon him). Imaam Nawawiy also mentions in Al-Majmoo’ that: “Its recommended that when the gorge flows (with rain water) to perform wudu (ablution) and ghusl (washing) from it. And if he or she is not able to do both then at least to perform wudu (ablution) from it. This article was originally featured on Fiqhul Hadith in June 2012. Born in Cape Town, South Africa. Graduate from the Islamic University of Madinah. Specializing in the field of Islamic Jurisprudence and its Principles. Many of us are aware of the environmental benefits of trees. They provide shelter and food for animals, purify the air of pollution and regulate the temperature within urban environments. They play a critical role in the quality of human life as well as the environmental well-being of our communities. Few would argue against the importance of trees, but have we really considered their full potential and the economical value of the services they provide? Urban forests do more than beautify the scenery. They represent an important investment in environmental condition, human health and the overall quality of life. The trees in the City of Toronto’s urban forest are worth an estimated $7 billion, or about $700 per-tree. Toronto’s urban forests provides residents with over $80 million, or about $8 per-tree, worth of environmental benefits and costs savings each year. For the average single family household, this works out to $125 of savings per annum. For every dollar spent on annual maintenance, Toronto’s urban forest returns anywhere from $1.35-$3.20 worth of benefits each year. From their study, trees play an important role in managing wet-weather flow, regulating air quality, contributing towards energy savings and sequestering carbon. This has become increasingly important as climate change has altered the weather patterns across Canada, with some areas experiencing extreme drought while others face localized flooding. There are also the societal benefits of a healthy forest canopy such as the aesthetic value of trees and their importance in naturalizing parks and boulevards. In another study, TD Friends of the Environment found that 96% of Canadians feel it is important to plant trees today in order to sustain a healthy environment and improve the quality of life for future generations. While only two in ten Canadians participate in the tree-planting or greening initiatives, two-thirds were willing to volunteer a few hours if they believed there was a community benefit. There is a strong desire by Canadians to enhance the forest canopy and protect our natural areas. What is Islam’s perspective of trees? The Islamic tradition is rich in references about our responsibility as Muslims to act as stewards of the environment. The Quran also has numerous passages that describe the lush gardens and trees in heaven, highlighting their value not only in this world but their significance in the hereafter. There are several sayings from the Prophet Muhammad (SAW) that relate the importance of trees and plants in Islam. Allah's Messenger (ﷺ) said, "There is none amongst the Muslims who plants a tree or sows seeds, and then a bird, or a person or an animal eats from it, but is regarded as a charitable gift for him." "I was throwing stones at a date-palm belonging to some of the Ansar. They tool me along with them to the Prophet (ﷺ). He said: "O Rafi'! Why were you throwing stones at their date-palm?'" He said: "I said: 'Out of hunger, O Messenger of Allah! He said: 'Do not throw stones at them, eat what falls. May Allah fill you and quench your thirst.'" The Prophet (ﷺ) used to stand by a tree or a date-palm on Friday. Then an Ansari woman or man said. "O Allah's Messenger (ﷺ)! Shall we make a pulpit for you?" He replied, "If you wish." So they made a pulpit for him and when it was Friday, he proceeded towards the pulpit (for delivering the sermon). The datepalm cried like a child! The Prophet (ﷺ) descended (the pulpit) and embraced it while it continued moaning like a child being quietened. The Prophet (ﷺ) said, "It was crying for (missing) what it used to hear of religious knowledge given near to it." We were with the Prophet (ﷺ) and fresh dates of a palm tree were brought to him. On that he said, "Amongst the trees, there is a tree which resembles a Muslim." I wanted to say that it was the datepalm tree but as I was the youngest of all (of them) I kept quiet. And then the Prophet (ﷺ) said, "It is the date-palm tree." What we can take from these Hadiths is that planting and maintaining trees are an act of faith. Like all of creation, they should be respected and represent signs of Allah. In Surat Al-Hajj, Allah says, “Do you not see that to Allah prostrates whoever is in the heavens and whoever is on the earth and the sun, the moon, the stars, the mountains, the trees, the moving creatures and many of the people?...”(Quran 22.18). Trees are given special mention as Allah created them as one of the many signs of His existence. The next time you are in a park, take a moment to pause and reflect on the beauty of their stature, the complexity of their lifecycle and the blessings they bestow upon us and other animals. How can I become involved in planting trees? There are several organizations that host planting events throughout the spring and fall seasons. If you are unable to attend an event, you can also donate to have trees or native shrubs planted on your behalf. Tree Canada: A charitable not-for-profit organization, Tree Canada is committed to working with its corporate, government, and individual partners on tree-planting programs, including providing “ReLeaf” to areas suffering damage from natural disasters, offering funding to communities for fruit-bearing trees, providing schools with outdoor classrooms, and more. Evergreen: Evergreen is a national not-for-profit that has been working since 1991 to restore the connection between Canada’s cities and the natural environment. Focusing on four program areas—Greenspace, Children, Food and CityWorks—Evergreen builds partnerships with diverse groups and engages key influencers and the public to inspire local action and create sustainable urban development. TD Tree Days: As TD’s flagship urban greening program, TD Tree Days provides TD employees and their families, our customers and community partners the opportunity to demonstrate leadership in environmental stewardship in their local communities. If you are interested in increasing the forest canopy on your property, many municipalities will plant trees on City-owned boulevards at no cost. If you are within the Greater Toronto Area, LEAF is an organization the provides valuable information about trees and species that are best suited to urban environments. They also provided assessments of your property on which trees will thrive in your soil and light conditions. LEAF: LEAF is a not-for-profit organization dedicated to the protection and improvement of the urban forest and engages citizens in urban forest stewardship through planting, education and training. By Khaled Dardir - June 18-22 2012 marks International Pollinator Week. Pollination plays a pivotal role in the life cycle of plants and the goal of the campaign is to raise awareness about the importance of these species. Pollinators range from bees and moths to birds and bats. The diverse range ensures that both flowers and crops are able reproduce and contribute to the overall health of the ecosystem. Khaled Dardir explores the role of one pollinator, the honeybee, and the health benefits associated with honey. And your Lord inspired to the bee, "Take for yourself among the mountains, houses, and among the trees and [in] that which they construct (Surat An-Naĥl: 16:68). Then eat from all the fruits and follow the ways of your Lord laid down [for you]." There emerges from their bellies a drink, varying in colors, in which there is healing for people. Indeed in that is a sign for a people who give thought (Surat An-Naĥl: 16:69). We may be in the depth of winter across Canada, but to many gardeners, this is the time of year to plan for the upcoming season. Local community groups are also preparing for the advent of spring and are putting final touches on proposals for gardening projects on open roofs, parking lots and empty fields within their neighborhoods. Community gardens have begun to flourish in recent years, especially within urban centres. While collective gardening is not a new phenomenon, it has taken root and evolved beyond local parks, schools and recreation centres to include underutilized regions of the city such as vacant lots and hydro corridors. The emerging movement towards growing and purchasing local, organic produce has generated interest in community gardens, especially in cities where residents lack access to arable land. There have also been several health scares over the last few years over contaminated produce which has fueled the drive for organic products. Aside from the health benefits of eating naturally grown produce, the movement as a whole has created several positive impacts in the communities they serve, including revitalizing neighborhoods and fostering a new generation to make more conscious food choices. Places of worship have also been looking at developing community gardens to serve both their congregations and the general public. Generally their facilities are situated on large open lots that are able to be easily converted into small-scale gardens or into larger agricultural plots. The congregations they serve also possess a diverse range of skills that are able to build, create and maintain an ongoing garden. After the garden is established, it becomes a beacon for the community by providing educational and recreational opportunities for children and seniors, raises awareness about how our food is grown and physically connects the spiritual teachings with the natural word. The produce that is cultivated can be donated as a fresh alternative to local food banks or used in soup kitchens to feed those less fortunate. While the initial push has mainly been from churches, community gardens are now beginning to become established within mosques as well. Opportunity to welcome other faith and cultural groups to take part in this project and work together for a good cause. Gaining the pleasure and mercy of Allah by being merciful to others. While there are many benefits to community gardening, there is also a lot of preparation that goes into developing and planning before the first shovel hits the ground. This includes forming a dedicated team to take ownership of the garden, developing and designing the site, taking an inventory of the materials needed, securing the necessary funding and ensuring continued support for the garden in future years. 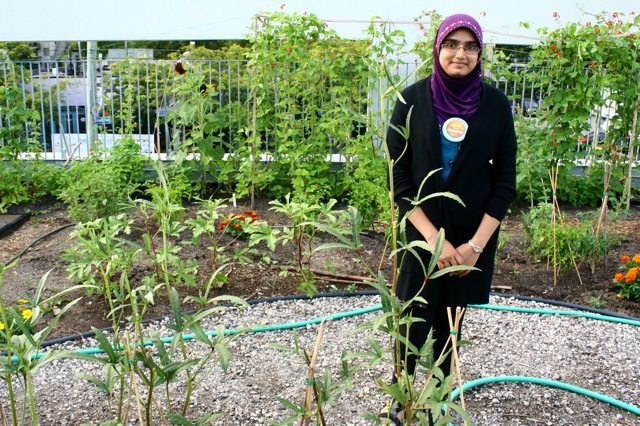 There are many resources available for those looking at creating a community garden at their mosque. Recently, the Noor Cultural Centre held a workshop entitled A Beginners Guide to Urban Farming, presented by Young Urban Farmers. Their organizations website provides a wealth of information on edible gardens, plants ideal for urban environments, soil management and pest control. The Toronto Region and Conservation Authority also held a workshop this past fall entitled Creating a Community Garden at your Place of Worship. There they presented resources from the David Suzuki Foundation which includes information on planting native species and attracting pollinators to your garden. They also went through a workshop module from Food Share, which guides you through the steps in recruiting and securing funding for the development of a community garden.